Home › Benefits & unemployment › Do we trust politicians or the Church more in the debate over poverty? Do we trust politicians or the Church more in the debate over poverty? The political narrative that we’ve seen develop over the last couple of years relating to welfare and poverty has changed considerably as the impact of spending cuts, rising prices and stagnating wages have begun to bite. It’s really not that long ago since politicians were happily referring to benefit scroungers and the lazy unemployed. Fortunately things have moved on; the debate has matured and rather than painting a picture that plays on our prejudices, the focus is now more on the realities of life on the breadline. What many people have not realised is how much impact the church has had on this agenda. Looking at recent news stories we have seen plenty of talk around the practices of payday lenders which was triggered by Justin Welby’s warning that he intended to put Wonga out of business. Foodbanks run almost entirely by the Trussell Trust through churches around the country have rapidly become a regular talking point. Even last night the Daily Mail reported on Iain Duncan Smith’s Department for Work and Pensions getting very annoyed with a Church Action on Poverty advert with political overtones blaming the Government’s welfare changes for thousands going hungry. Ed Miliband’s pledge to crack down on Fixed Odds Betting Terminals that have been described as the ‘crack cocaine’ of gambling and are more commonly found in areas of low income is nothing new. The Evangelical Alliance has been lobbying in parliament to have their impact curtailed since February. The list expands if you consider Justin Welby’s influence on the Banking Standards Commission calling for morality to be a stronger influence in the banking and finance sector. Of course the church is not the only voice on these matters. One particular individual, Jack Monroe has found herself as a poster girl representing those struggling to get by on benefits and low incomes. Her rise to prominence was highlighted recently when a petition in her name launched by the Mirror calling for a parliamentary debate on hunger and food bank use in the UK reached over 100,000 signatures in less than two days. The Labour party subsequently raised it as an Opposition Day Debate in the House of Commons on the 18th December. Foodbanks are a highly emotive issue and the response to the petition demonstrates that despite what the press may say about the public’s support for benefit cuts, there is still a strong compassionate streak running through our society that finds extreme poverty and hunger unacceptable. The high levels of charitable giving, especially for situations like that faced in the Philippines, even when money is tight confirms this. Over 350,000 people received three days’ emergency food from Trussell Trust foodbanks between April and September 2013. This has tripled since the same period last year. The public wants to see politicians considering the reasons for this even if the conclusions may make for uncomfortable reading. This is in fact happening behind the scenes despite indications from some politicians and papers that this is not the case. The Department for Environment, Food and Rural Affairs has commissioned research into foodbanks which was reportedly submitted in June. The Government has said the conclusions will be published once necessary review and quality control processes are completed, but disappointingly as things stand there is no sign of them appearing any time soon. 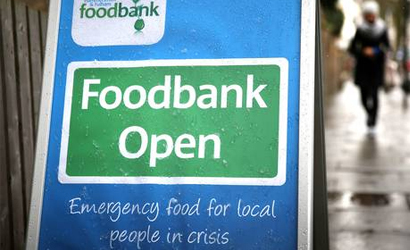 A new All Party Parliamentary Group on Hunger and Food Poverty – co-chaired by Frank Field MP (Lab) and Laura Sandys MP (Con) – is now investigating “the root causes of hunger and food poverty” and the increase in British demand for food banks. Too much of it became political point scoring and arguing about whose fault it is. Iain Duncan Smith did nothing to help himself or the view of some that the Government does not care by walking out halfway through. Labour’s decision to include in the motion a number of their own policies rather than just stick to the subject in hand meant there was no way coalition MPs were going to vote for it, which was then incorrectly used as evidence that they are against further investigation into foodbanks. Despite Labour’s attempts to frame the Government as callous and insensitive, there can be no winners. The Government has no option but to cut public spending because the rate of increase in its levels of debt are huge and unsustainable. This inevitably leads to pain for most of us to a greater or lesser extent, but if Labour had not enjoyed borrowing so much when they were in power, these cuts would not need to be so severe. If Labour could be honest enough to admit this perhaps their attempts to draw out government failings might have more credibility. At the same time if the Government could show it was doing more to try to do more to reduce delays in benefit changes and payments, which are one of the most common reasons for referrals to foodbanks, it would show a genuine attempt to engage with the issue that we are seeing little of at present. We can continue to argue the reasons why the number of people being referred to foodbanks is increasing, but unless serious consideration is given to how the situation can be improved, most of that talk is meaningless. in some circles foodbanks have become a political football for politicians to use to score cheap points against each other. Iain Duncan Smith may think that the Trussell Trust has a political agenda against welfare reform, but to give this too much attention is to ignore the truth. Foodbanks are mostly run by churches and Christians who care about those in need. It is a practical response trying to do something good because Christianity teaches that we should not forget the poor. The real agenda is making an effort to improve people’s lives. Sometimes the church gets close to being party political about this (as in the Church Action on Poverty adverts) which can unhelpfully complicate things, but even when there is no political motivation, politicians coming at it from their own standpoint have a habit of misreading the signs. Jesus wasn’t party political in his situation. He just talked about the Kingdom of God and God’s values. He criticised injustice and as a result the authorities took it personally and denounced him. Hopefully those in charge of the welfare system here and now will have more sense and not take foodbanks and the reasons for their use as a personal attack. They have a good and important role that offer more than just free handouts. One quote from the Opposition Day Debate was that foodbanks “give emotional support almost as good as the food”. The methods of the welfare system can never provide the range and depth of individual support and understanding that those at a local community level can. If foodbanks were ever to be swallowed up by the state, it would be a disaster. Although the concept of Big Society has dropped out of fashion, these are the perfect example of what happens when groups just get on with helping out those around them without any state interference. This is the best of society and in particular the church being active within it. The more politicians (and sections of the press) acknowledge this for what it is rather than placing their own partisan spin or preconceived ideas upon it, the more they listen rather than pushing their own agenda, the more they embrace the good that churches are doing for the benefit to others out of their own pockets, the more chance there is for us to make real progress and find the answers we need. ‹ Is the proposed change in Northern Irish abortion legislation to be welcomed? Reblogged this on Lower than the Angels. ‘The Government has no option but to cut public spending because the rate of increase in its levels of debt are huge and unsustainable’ – economic c**p. Cuts are driven by the rich and people like yourself who peddle this ideologically-driven rubbish. ; suggest you read some economics: Notably Paul Kaufman (Nobel prize winner), David Blanchflower and other Keynsian economists. For the ideology read the American Writer and Christian academic Marilynne Robinson, especially her essay, Austerity as Ideology in her book – ‘When I was a Child I read Books’. ‘This inevitably leads to pain for most of us to a greater or lesser extent, but if Labour had not enjoyed borrowing so much when they were in power, these cuts would not need to be so severe’ – more economic rubbish. The Tories were supportive of the borrowing (and complained of over regulation of the banks) and spending until the crash of 2008; blaming Labour is a political ploy of the right, which doesn’t wash. Did Labour borrowing cause the crash of the Lehman Brothers, the American economy, the Greek economy, the French, the German, etc. etc.? Labour borrowed more after the war AND created the Welfare State and the NHS. Tax the rich, Tax the banks (Transaction Tax), chase the tax dodgers, NOT THE POOR. Sorry automatic computer “Correction” – right wing infiltrating my phone. Mike Dixon – PLEASE tell us who, in your opinion ARE the rich. Yes I know and agree that the greedy overpaid bankers are disgrace. As are overpaid footballers and so-called celebs, who add NOTHING at all to the benefit of society. But you really should identify just who you are talking about when you use the term – rich. Tell us what riches are. btw the genuine poor don’t pay income tax. As for immigration there has to be a limit to the open doors policy for the benefit of those already here. I wonder how moral you consider it to be to encourage skilled workers from abroad to leave their needy countries, who have trained them btw, to come and work for us when we are well able to train our own people. Personally, I think it it highly immoral to take skills from poor countries and bring them here to benefit us, and we have enough of our own unskilled young people to train and find employment for surely. great post, thanks for this- will reblog. Thank you. Always good to share! Jesus wasn’t party political in his situation. He just talked about the Kingdom of God and God’s values. I know the Tory party goes back to Methuselah, if not the dinosaurs, but Jesus was pretty tough on the Pharisees and Sadducees and other conservative groups/parties. Christian Action has to be grounded, incarnate, in reality (Christmas) and that includes the messy world of politics. Being “nicey,nicey” when people are being forced out of their homes because of the bedroom tax, and the homeless has risen by 30%, and immigrants are being demonized is not been faithful to the Gospel. What a pity Mike Dixon that you cannot have a reasoned discussion without spouting your left wing propagander. Until politics – and envy – are removed from the problem we shall never get a just and fair welfare system. RE. the so-called bedroom tax, the leftist furore that it has generated is very misguided; social housing is provided for those unable to provide for themselves privately, over occupation is wrong, it denies others adequate housing. If tennents want extra rooms then they MUST pay for them or agree to downsize that is fair and just. If I ever find myself unable to afford the upkeep for my home then I too shall have to downsize, and what is wrong with that. Absolutely. Someone has to challenge bad policy and look into the effects on the ground. The church also should be sinking to the level of inflammatory politics and I think the Church Action posters are a bit too close to the mark in this case. btw – Jesus did say that the poor would always be with us, I think. The problem is separating the genuine poor from those who enjoy the gravy train. Identifying those who are not poor in the accepted way, inadequate income, but who cannot manage their finances, do of course need help, help to understand why they are in need and help to budget sensibly, help to feed their families properly without buying expensive junk food or eating out, help to get their priorities right – Sky T.V. etc., for instance, may be nice but it isn’t essential to life. Perhaps as Christians we should give a far greater emphasis to the causes and not just the symptoms. Give a man a fish and you feed him for one day – teach him how to fish and you feed him for life. No point teaching a man to fish if there are no fish. How many properly-paid, secure jobs do you think there are out there? Do you really think there’s one for every unemployed person? Tom – It is always worth teaching a man to fish, not to do so is very short sighted. But just dealing with the symptoms without addressing the problems is not the way to go. To blame governments of either hue without acknowledging that there ARE other factors in the equation is really blinkered. btw It cannot be just or righteous that it is better to remain unemployed than to work. That encourages dependancy, and lack of self respect. Perhaps the reason for the dearth of well paid jobs is something that needs to be addressed, and that is less simple than some people might think. Lily – my point was simply to challenge your apparent assumption that the reason for unemployment lies with the unemployed. Many unemployed people are highly skilled, and highly motivated, but the jobs simply aren’t there. Teaching them more skills simply won’t help. Tom – I happen to personally know someone very involved in social housing. Many, many people DON’T know how to budget or how to feed their families properly without resorting to fast food etc. It is also the case that many resist any help to use their income more wisely. I say again politics have no place in welfare benefit management. So much of what I read on left wing websites seems to be motivated by pure envy and greed. Rich is someone better off than me, and enough to live on is more than I get. Surely someone needs to sort out the mess without the knee-jerk reaction that ensues every time a radical approach is mooted? I know that some highly skilled and motivated folk find it hard to get employment after redundancy, It took a son of mine 5 months to do so, he was over qualified, having a string of letters after his name, but that is the exception rather than the norm. In my neck of the woods there are families where there has been no one in employtment, ever, for 4 or 5 generations – fact. I truly believe that as Christians it would be a better approach to look at the reasons for the need for food banks etc. providing a bag of goodies does nothing to change the situation for more than a day or two. Lily – please explain to me what you think a ‘politics-free’ approach would look like. It seems to me that you’re simply insisting that the approach only involve your preferred politics. My point is precisely that politics is about values and priorities – and can therefore be right or wrong, better or worse. I don’t see an alternative to politics. I’m afraid I’m also going to have to disagree with your ‘personal experience’ – it is often the case, in my experience, that how one perceives others is a function of one’s pre-existing ideology. So claims that [poor] people just cannot budget are simply a reflective of preconceived judgments. This is especially so when it contradicts the best available evidence – see the report I posted before. The wider problems exist in the economy. No amount of tinkering with the social security system will change this. The rise of insecure, low-paying jobs, and the removal of workers’ rights are a serious reason for concern. Zero-hours contracts are just one example of this. There are very few jobs available in the economy – that is why people are out of work. There simply isn’t evidence that people are avoiding work, or that more training will significantly help. Referring to a ‘gravy train’ is a deeply unchristian expression of prejudice towards the poor. I really worry about your view of politics. You seem to think that partisanship is always wrong and inflammatory, and that we really need to get away from all that and remove ‘politics’ from the equation. It is important to recognise that such is not an apolitical point of view: it is fundamentally conservative. Milton Friedman (and other neoliberals) were enthusiastic about central bank idependence – precisely because they wanted to remove opposing moral and political judgments from monetary policy. Their values and aims then become invisible under the claim of dispassionate economic science. So of course Labour have to try to make political capital out of foodbanks – their proliferation is a grave moral wrong, and a damning indictment of the Government’s cuts to social security. You have exactly followed the Coalition’s defence by claiming that Labour is simply making ‘political points’ – as if there’s another option! Such a claim assumes that there is a non-political reason for foodbanks increasing, and that the Coalition couldn’t have done anything about it. It’s TINA rearing her ugly head. This is in completely contrast to the claims of those who run foodbanks. As a consequence, you’re quite wrong to say that Jesus wasn’t party political. The Kingdom of God is party political. Jesus was clear in his approach to the authorities that there were things he would not tolerate. We cannot also tolerate parties which violate God’s principles. That’s not to say that any one party is perfect, or that our debate about priorities is settled, but simply that we cannot – and must not – claim that party choice is a Jesus-free zone. Church Action on Poverty have got it right – criticising politicians (in a party-political way) is often a necessary part of remembering the poor. i.e. spending was more sustainable than when Labour took office. Really Tom!? – That’s why some half brained Labour M.P. said as Labour left office – hard luck the coffers are empty! Tom I could argue with you for a long time I won’t, but some of the points you make are simply untrue. Labour were in power when new hospital was built in my neck of the woods. The outstanding debt and the cost of maintaining that debt is horrendous.They didn’t pay for it at all just racked up a huge debt for posterity. We shall be paying for their folly for eons. And PLEASE do tell us which Political Party Jesus was signed up with. Church Action on Poverty certainly haven’t got it right they have a political bias. There is no room for party politics in a just approach to poverty and welfare benefits. Lily – if you do have evidence that I am wrong, please share it with me. I try to take my duty to ‘love my neighbour’ very seriously, and this means that I have to make my political choices on the basis of the best possible evidence, rather than trite comments or the tactless jokes of Liam Byrne. If you know of academic studies that contradict what I have said, I would very much like to read them. 1. Public sector debt and the budget deficit were smaller in 2007 (pre-crash) than when Labour took office in 1997. 2. Public spending increased, but not on ‘day-to-day’ spending – these were long-term investments (often one-offs). 3. Public spending was increased from a very low level. 4. Therefore, putting us on par with other countries, or our own history is not unsustainable. Following the crash, of course, tax receipts fell, and we ended up with a shortfall in revenue (as happens in recessions). This means that it is imperative to restore growth (and why it is such a shame that, despite inheriting a growing economy, the Coalition managed to make it flatline for so long). I suspect the hospital you’re talking about was funded by a PFI contract – in which case I would agree that they were a disaster. They are heavily criticised by the ‘left’, and many tend to see the policy as Labour’s capitulation to right-wing economics (by insisting on the necessity of private finance). Now, of course Jesus wasn’t a member of a political party, that’s a strawman. But to claim that Church Action on Poverty have a political bias is just wrong, and is precisely the kind of statement I was criticising before. People make those statements because they are already Conservative, and disagree with the message. I would really like to see some hard evidence that the charity are explicitly anti-Tory. What I suspect, and what certainly seems to be the case, is that they are anti-poverty. This inevitably brings them into politics, and party-politics at that, because some party policies have serious consequences for poverty. It is imperative for christians to side with political parties when they reduce poverty, and oppose them when they increase it. This is why I claim that Jesus is party-political. He preached the Kingdom of God – which requires certain ethical commitments. Political parties have distinct values and approaches. We are obliged to support parties whose values align with the Kingdom’s. We therefore have to have party politics in the welfare debate – there is simply no ‘value-free’ way to discuss it. btw The C.A.P. is quite plainly left-wing, one doesn’t need a PHD to work that one out. Lily, this is a deeply disappointed response. You’ve been espousing the values of a politics-free approach, and chastising others for ‘spouting left-wing propaganda’. And yet when I try to have a factual conversation, you accuse me of being a dyed-in-the-wool Labour supporter (and therefore incapable of having a conversation with? ), and ignore my points. I would also very much like to see your evidence that Church Action have a left-wing bias. It is not as plain to me as it seems to be to you, so I would to see your reasons. If it is simply because they disagree with you, then why is that not a good reason for you to challenge your own views? As for PFI contracts – I don’t think it is double-minded at all. It seems to me to be unchristian to blindly follow any political party, and I intend to be as critical of my preferred choice as I am of others. In this context (as a Labour-supporter) I think PFI contracts were a disaster. Further, I think they were a right-wing betrayal of true Labour values. But I do not think they were the reason for any over-arching ‘financial mess’. What I said was that Labour spending was sustainable. Then there was a world-wise financial crisis, and we entered into recession. This recession, and the subsequent bailout, is the reason for our subsequent deficit, and our now much-inflated debt. It is simply a Conservative lie to claim that our problems were caused by Labour hiring extra nurses or teachers, or helping pensioners out of poverty. This recession was the reason Liam Byrne left the note he did (such notes are apparently a political tradition). It’s not as if a Government ever actually has ’empty coffers’ – they work very differently to individual households. The Coalition’s spending cuts, privatisations and degregulation are ideologically motivated – there is no economic justification for them. I don’t see the issue with my final paragraph. Politics is about values. Jesus preached certain values. Therefore some parties will be more in line with the Kingdom than others. I certainly don’t think Jesus would be an uncritical friend of any party, but I do think he (and the prophets with him) would have some sharp words for our current Government. I would also add that I think I have at least a little evidence about your political views. You’re clearly anti-Labour (and anti-Left). You could be an Orange Booker, but I doubt it. I suspect that you’re a lifelong Tory supporter, although you may now be flirting with UKIP. To hazard a guess, I suspect that you’re a big fan of politicians like Iain Duncan Smith, Michael Gove and Eric Pickles, very suspicious of David Cameron’s modernisation programme, and think that the biggest issues in UK politics are ‘scroungers’, immigrants and the EU.